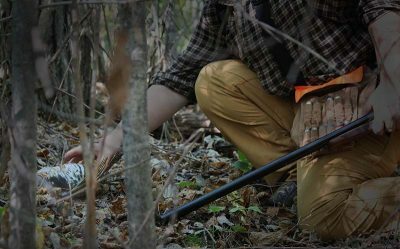 Hunting ruffed grouse can be both fun and frustrating at times. Even when your bird dog manages to lock down a solid point there are a lot of factors that will end up resulting in a grouse flying away & your gun empty. Sometimes, you just need to look to other hunters for their best ruffed grouse hunting tips. Some of the best ruffed grouse habitat is in some seriously thick cover. While many hunters think that having a shotgun loaded up with multiple shells will give them the biggest advantage, the reality is that you likely aren’t going to get multiple shots off at a grouse in areas like this. Since it’s so thick, I always opt for the shortest barrel over/under that I own – a Browning Citori with a 24 inch barrel. Dan Dessecker of Rice Lake holds a ruffed grouse brought to him by Blu, his 3-year-old German short-haired retriever, on a ruffed grouse hunt in Rusk County. Photo taken Oct. 20, 2011 by Paul A. Smith. This is going to go against everything you’ve learned about shooting a shotgun, but I can tell you with absolute certainty that the number of grouse in my vest each hunt went up after I figured it out. When you flush a grouse, get into the habit of planting your front foot and driving backwards. This is going to create an extra 12-18 inches of empty space for you to swing your gun through the bird. If you had followed conventional wisdom and leaned forward into the shot, you are almost definitely going to hit some brush with the barrel of your gun when you’re swinging through the grouse. Leaning back opens up just enough space (assuming you’ve got that shorter barrel) to give your room to swing. This is going to seriously increase your chances of success. Of all of our ruffed grouse hunting tips, this one has been the most effective for me. Seems like the most obvious of any possible ruffed grouse hunting tips right? You’d be surprised how many guys only hunt the cover that is easy or convenient to hunt. The most hunting pressure ruffed grouse see is along roads simply because a lot of hunters are too lazy to work their way through thick cover. They want that easy bird, but the reality is the easy birds don’t typically live long enough to get a chance at them. My advice is to get off the road & locate some quality grouse habitat based on what grouse are eating near you. You might end up missing more shots in these areas (if you manage to get a shot off at all) but you’re going to see far more birds & increase your chances of success. A good bird dog is your best friend when it comes to bagging a decent number of grouse. This tip is an easy one if you have a bird dog, and a lot harder if you don’t. Without a bird dog you’re just going to be walking around hoping you bump a bird. Don’t get me wrong, that certainly works from time to time. But your best chances are going to come from moments when your dog has a solid point so that you can get into position & prepare yourself for the shot. If you’re using a bird dog throughout the grouse season, you should also really make sure that you’re giving them the best chance of success. Make sure you go into the season with your dog in good physical condition & a proper diet. There are some great companies out there like Alpha Dog Nutrition that are working hard to make sure your dog is going to be healthy late into the season. They’ve got a lot of tools in the toolbox specifically tailored to keep active hunting dogs healthy & in the game. Whether it’s an omega 3 to keep their skin & coat healthy, a joint supplement to help fight against stiff joints & arthritis, or something to help with post-hunt recovery, they have you covered.